This Fresh Basil Vinaigrette recipe is super refreshing and perfect paired with a seasonal salad! This simple dressing comes together in the blender and lasts all week in the fridge. 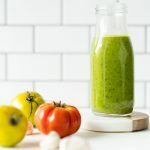 Think pesto sauce in dressing form – with extra brightness from lemon juice and apple cider vinegar!! THEN ADD THE OIL: Add in the extra virgin olive oil and blend again until emulsified, about another 30 seconds. Store in a lidded jar in the fridge for 1-2 weeks. When serving straight from the fridge you may need to spoon it on since this oil will solidify a bit at colder temperatures. You can also take it out before you intend to use it and allow it to come to room temperature while you assemble your salad or bowl.